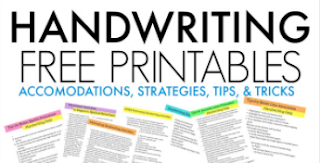 You know we love to share fine motor activities here on the blog, right? 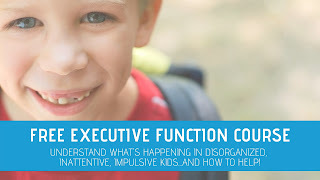 Kids' crafts that promotes fine motor development is one that can be used to work on developmental goals, functional skills, and dexterity. This yarn fine motor jewelry craft is a process art project that uses this month's process art material in the Process Art Challenge. Each month' we'll join several other bloggers to create an art project that uses a specific material in a process art activity. 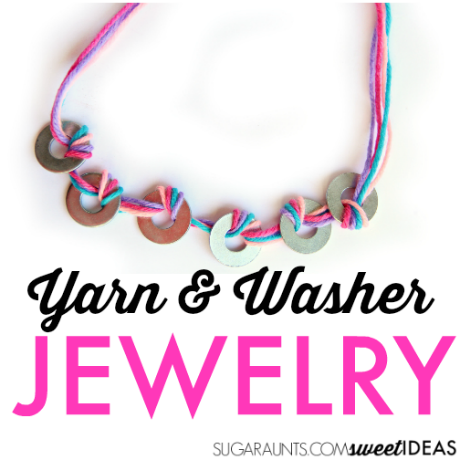 We used yarn and washers to work on fine motor skills with a fun result: yarn washer jewelry! 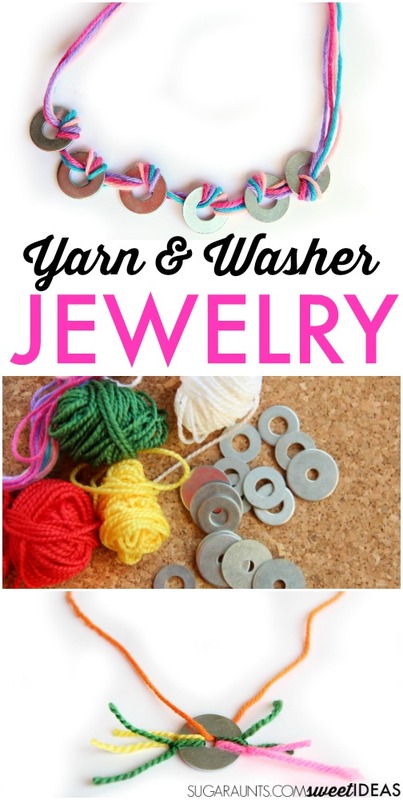 For this art project, I pulled out our supply of yarn, a pair of scissors, and the washers. I showed my kiddos how to push the yarn through the washers and how to tie knots around the edges. They were pretty excited to try their own version of necklaces, bracelets, and rings. We tried making a few lace ribbon designs, too. 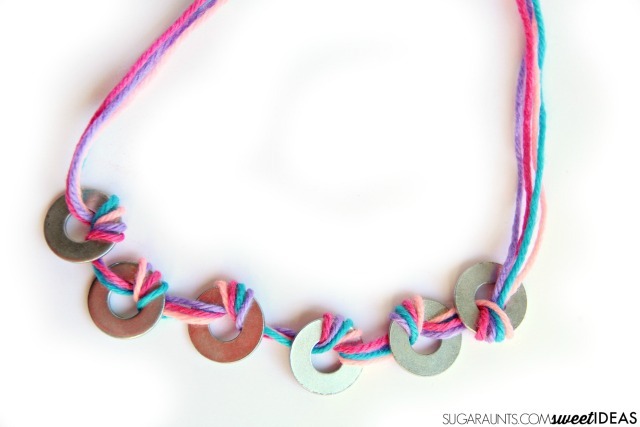 To make the looped washer necklace, push several strands of the yarn through a washer. Send it through another time and then on to the next washer. 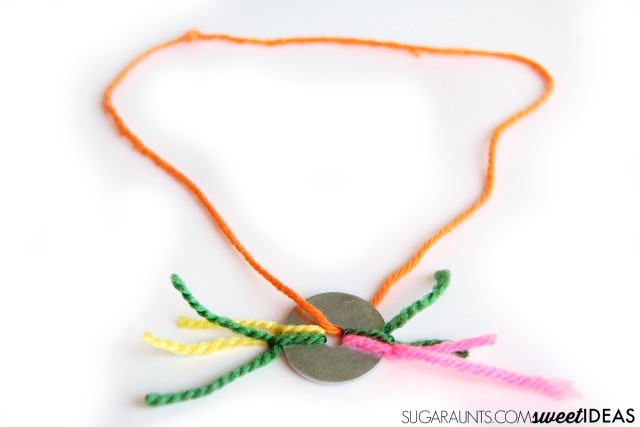 To make this task easier, try using tape to create a hard end for threading. 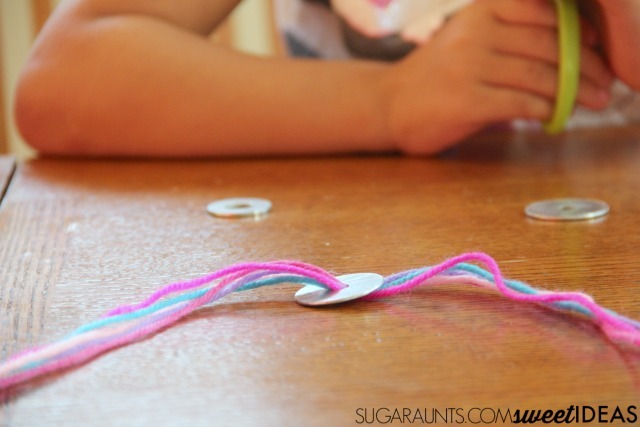 Try tying knots for more fine motor work. Working the yarn through the washer is an exercise in tripod grasp and improving strength of the intrinsic muscles of the hand. The muscles that define the arches of the hands are essential for separating the two sides of the hand which is needed for tasks such as pencil grasp, manipulating buttons, zippers, snaps, shoe laces, and scissors. When a child pushes the yarn through the washer, they are building their visual motor integration skills. 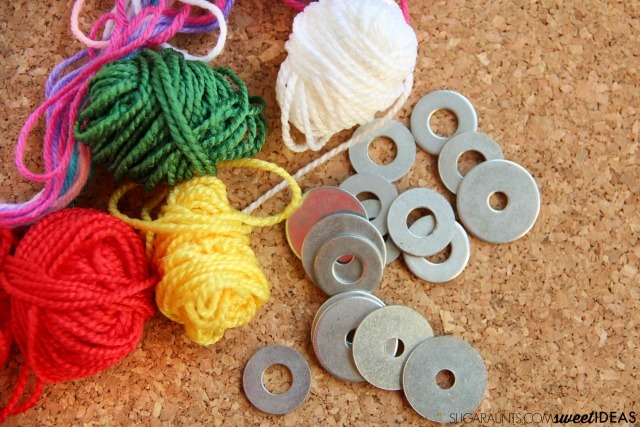 Manipulating the flimsy yarn into the washer can be a difficult task for kids who have difficulties with coordinating and integrating visual input with the coordinated motor output of their hands in order to accomplish this fine motor task. 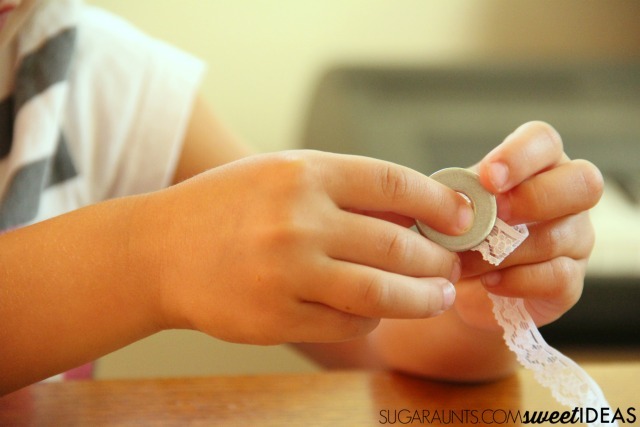 For kids who are struggling with this activity, try using cording as it will not fray with multiple attempts to thread the washers, or for assistance, a thicker cording would work, like this one. 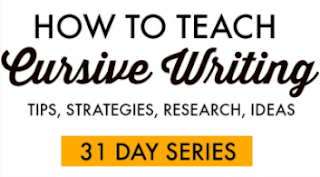 Want to see all of the yarn projects in this series?